The last wine influenced beer I had from Delaware’s Dogfish Head, it was the impressive Noble Rot. The combination of the wine must and the saison base made for an intriguing and thoroughly enjoyable brew. 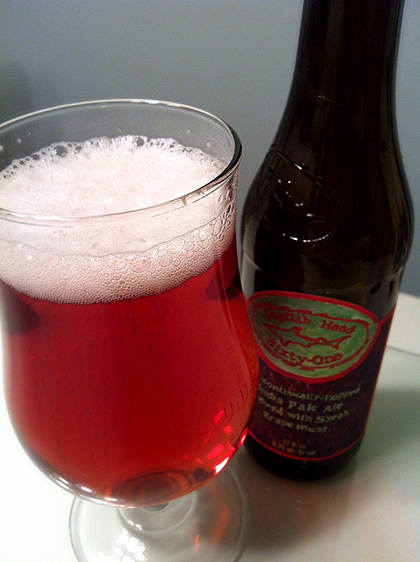 The brewery’s Sixty One also uses grape must in it’s recipe, but with a different base recipe  and a different outcome. Sixty One utilizes the company’s ever popular Sixty Minute IPA is at the core of this brew, but with the addition of Syrah grape must. The combination is interesting, but not nearly as smooth or as complimentary as that of Noble Rot. Despite this particular bottle having a bottling date of 10/31/2013  I cracked it open December 8th  it had an old characteristic to it. Where a bottle of Sixty Minute IPA is usually quite fresh and active, this beer tastes dated. Perhaps it’s the grape must that gives it that trait. Sixty One pours a dark, purplish copper in color with a pink-tinted cap of foam. The beer as a forward grapey, vinous character as grass, grain and peppery hops persist. The Sixty Minute base shines through more here, but with the added vinous flavors. Tastes of old grapes, pine and something else that I can’t quite put my finger on fill the mouth aboard the active carbonation. The brew is quite drying with a late touch of malt sweetness. Sixty One is an interesting beer that brings a varied array of flavors to the palate, but it’s also one that just doesn’t work for my own personal tastes. The combination of IPA with the grape must feels a bit clunky to me and not nearly as smoothly incorporated as the Noble Rot example. Maybe I’ll give the beer another chance in the future. 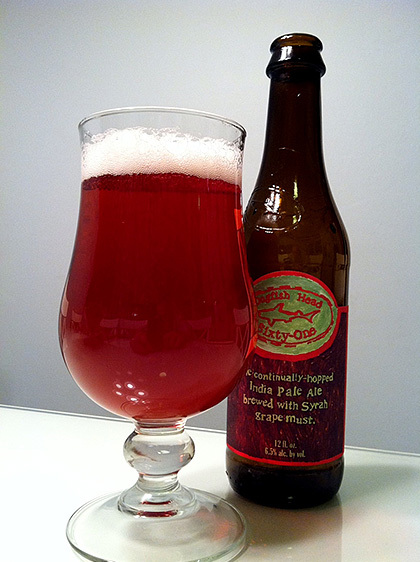 Share "Dogfish Head Sixty One"